Home / Blog / Should we leave the heating on for our pets? 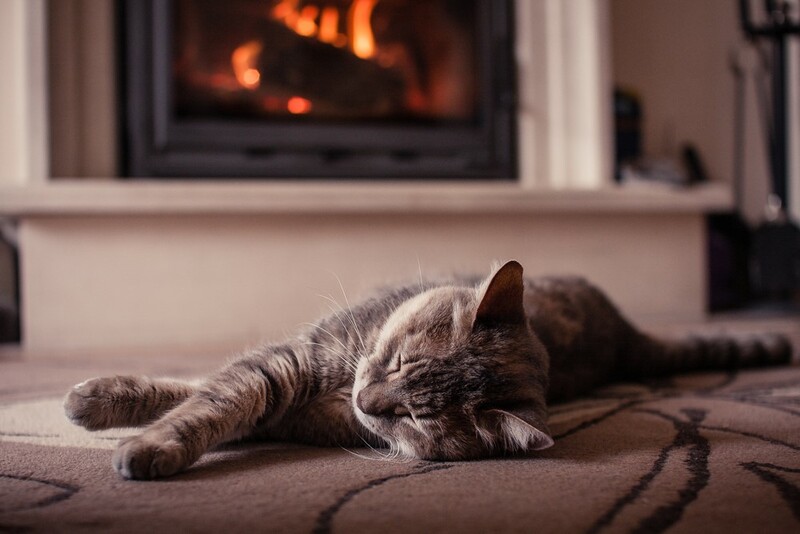 Should we leave the heating on for our pets? A recent survey by the Energy Savings Trust found that half of pet owners leave the heating on for their dog or cat while they are out for the day. Nationally this amounts to around £78 million in additional heating costs. While this is costing each pet owner around £140 per year, a single visit to the vet’s can cost around this much, so the price tag for the indulgence isn’t a big incentive to make an energy saving at the expense of our pets’ creature comforts. However, most cats and dogs have thick fur coats to keep them warm in the winter. You know all those tufts of fur that shed everywhere in the spring? That’s the fur coat they’ve grown specially to keep themselves warm in the winter. Pets also have a knack of finding the most comfortable, draught-free locations in which to doze between mealtimes. Cats in particular are masters at finding the warmest spot, even following patches of sunlight as the sun moves around the home during the course of the day. They are also very clever at avoiding the draughtiest spots, and unless there is a patch of sunlight to doze in will avoid sleeping on the floor as this is where the coldest currents of air are found. It generally goes unnoticed that the worst of our cold draughts are caused by open chimneys. Over 11 million properties in the UK have redundant chimneys. Having an open chimney is like leaving a window open all the time. Chimneys are designed to actively pull air out of a building, and carry on doing this even when a fire isn’t lit. This escaped warm air generally goes unnoticed, but it needs to be replaced so pulls in cold air from around doors and windows in its wake. This cold air passes through the house via gaps under doors, which is why we get cold feet, why your cat doesn’t sleep on the floor, and why your dog sneaks up onto the sofa. The Chimney Balloon blocks around 90% of airflow up a chimney. As soon as a Chimney Balloon is fitted, many of the cold draughts from around the home disappear. Customers who fit our chimney draught excluders report having warm feet at last. If you were to follow cold draughts around the home with a smoke pencil, you would see just how much cold air is pulled along at floor level from under doors, resulting in low level cold draughts that are in a constant cycle of airflow as it is pulled up the chimney. Block the chimney, and these cold draughts are dramatically reduced. So if you think that leaving the heating on for your dog or cat while you are out for the day is an indulgence too far, then treat them to a Chimney Balloon to keep your pets comfortable while they are home alone!